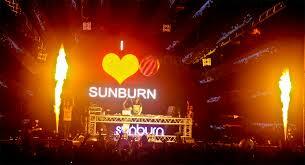 PUNE: The Airport police denied permission for 'Sunburn', the popular musical concert, saying that the organisers will use high powered light beams banned near the Lohegaon airport. The venue is 1km away from the airport. The organisers had applied for permission on November 30 to host the festival from December 28 to 31 at Mahalaxmi Lawns, off the Ahmednagar highway near Wagholi cctroi post. Police inspector Vilas Sonde of the Airport police issued a letter to the organisers stating that permission to the event cannot be granted. A copy has also been sent to the higher-ups, including Pune police commissioner Rashmi Shukla. A team of policemen visited the spot where close to 50,000 to 60,000 people are expected to attend the programme. In the past, many social organizations and political parties have opposed it stating that it was encouraging consumption of contraband. Sonde said the programmes are generally organized in the evening and at night. Mahalaxmi Lawns is close to Lohegaon airport, which is a strategic airfield of the Indian Air Force. The Pune police have already banned any use of high powered light beams in the area since it a hindrance to the civilian and IAF aircraft. Since the event will attract thousands of people and vehicles, it will affect traffic on the roads, Sonde said. The festival was earlier held in Goa but it is also hosted in Pune. Last year, it was held on a hill in Kesnand, off the Pune-Ahmednagar highway. It is known for its eye-catching production, with the staging, lighting, visuals and pyrotechnics.